The Short-Term Financial Assistance Program assists eligible adults who are experiencing an unexpected and temporary period of financial hardship, oftentimes caused by a job loss or serious illness. 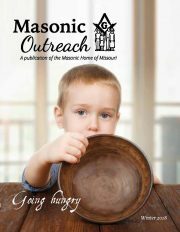 In Fiscal Year 2018, the Masonic Home provided $89,690 of short-term financial assistance. Individuals who qualify for short-term financial assistance are Missouri Masons, their wives or widows, and Eastern Star ladies in good standing. Financial assistance is provided with the anticipation that financial hardship will be resolved and is typically provided for one to six months.